The only book of its kind! 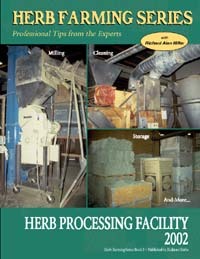 Describes how to set up a herb and spice processing facility that can handle up to 400 acres of herb product. Covers warehouse requirements, milling machinery, cleaning and sifting machinery, dust control, sacking requirements, and support equipment. Gives estimated budget requirements for a plant built with both used and new equipment. Also sources of equipment and other resources. 46 colour photos; 24 pp.